Just How Bad is California's Credit Rating? As we mentioned in our article yesterday titled "California's Continuing Economic Woes", California has a pretty poor credit rating. 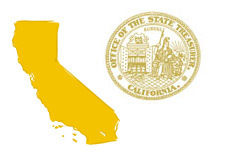 As a matter of fact, there is no state that has a WORSE credit rating than California. The state is currently facing a raft of economic problems, from high unemployment to falling real estate values to cratering tax revenues. This all contributes to massive budget gaps which must be closed every year. According to the California Debt and Investment Advisory Commission (CDIAC), California had total state and local debt of just under $81 billion dollars as of November 30th, 2009. Of this debt, $61.2 billion was long-term debt, while $19.7 billion was in the form of short-term debt. As the economic woes in California have worsened over the past decade or so, their credit ratings have taken a major hit as well. The problem with dropping credit ratings is that the cost of servicing debt becomes more expensive. As a result, interest payments have become more expensive, which puts even more of a strain on the state's finances. Think about it - let's say that you have two friends. One has a perfect credit rating, while the other has a horrible credit rating and a raft of personal financial issues. Which person is a greater risk in terms of being able to pay you back? Which person would you need to charge more interest to? Fitch - BBB. "Good credit quality. BBB ratings indicate that there is currently a low expectation of credit risk. The capacity for timely payment of financial commitments is considered adequate, but adverse changes in circumstances and in economic conditions are more likely to impair this capacity. This is the lowest investment-grade category." The BBB rating from Fitch is three steps down from their top rating of AAA, and just one step above BB, which is considered to be "speculative". BB is NOT considered "investment grade" by Fitch. Moody's - Baa1. "Bonds that are rated Baa are considered as medium grade obligations, i.e., they are neither highly protected nor poorly secured. Interest payments and principal security appear adequate for the present but certain protective elements may be lacking or may be characteristically unreliable over any great length of time. Such bonds lack outstanding investment characteristics and in fact have speculative characteristics as well." Again, three steps away from the highest Aaa credit rating, and just one step above "Ba", which is "judged to have speculative elements". Standard & Poor's - A. "An obligation rated 'A' is somewhat more susceptible to the adverse effects of changes in circumstances and economic conditions than obligations in higher-rated categories. However, the obligor's capacity to meet its financial commitment on the obligation is still strong." This rating is two steps down from Standard & Poor's highest possible rating of AAA. In July of 1986, Fitch had a perfect rating of AAA on the long-term debt obligations of California. In October of 1989, Moody's had a perfect rating of Aaa for the state's GO bonds. In July of 1986, Standard and Poor's had a perfect rating for California's long-term bonds as well. Since then, things have completely gone downhill, and California now has the weakest credit ratings of any of the other states. The only other states that are even in the same vicinity as California seem to be Illinois (A, A2, A+) and Michigan (A+, Aa3, AA-). It says quite a bit that California has a significantly worse credit rating than Michigan, which has also been under siege since 2000. Not trying to pile on California here, but the decline in their credit rating over the past 20-25 years is quite remarkable, and should be a clear indicator of the mess that the state currently finds itself in.